Arrhenatherum elatius bulbosum variegatum, after saying that twice I am worn out. 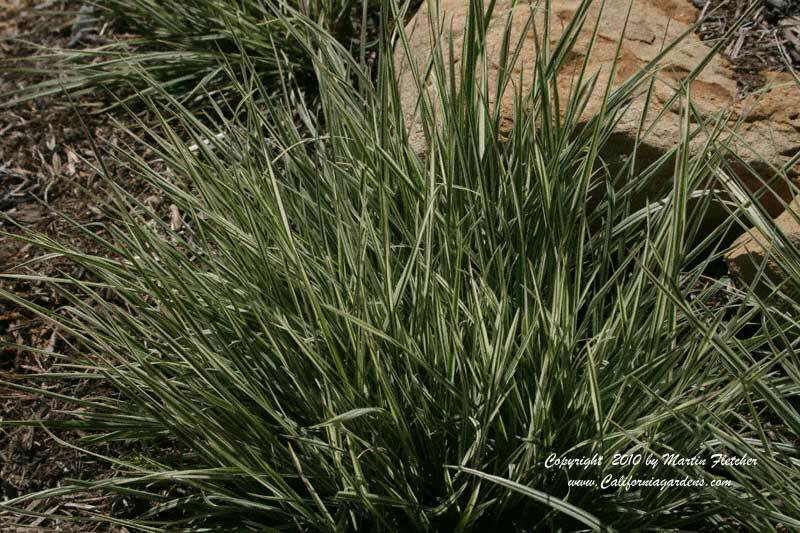 The Bulbous Oat Grass is a nice addition to the ornamental grass garden, the rock garden, or the perennial bed. This is often listed in catalogs as Arrhenatherum bulbosum. This small variegated grass grows to less than a foot tall. At the base of each stalk there are a stack of bulbs, that remind some of a rattlesnakes tail. There are a couple of other grasses that share that name, it seems like the least confusing is using Bulbous Oat Grass. Arrhenatherum bulbosum grows in full sun to part shade. In our east exposed planting in clay soil ours gets watered once or twice a month during the Summer. If I let it go too long, the plants go deciduous but reliably come back. Bulbous Oat Grass is hardy at least to the mid teens and likely lower. Grassy foliage of Arrhenatherum elatius bulbosum variegatum the Bulbous Oat Grass. High resolution photos are part of our garden image collection.